Buying forex in India has traditionally been limited to brick and mortar businesses. A person would need to physically visit each bank or money changer store in their locality. Enquire about the exchange rates and service costs of buying forex from them. Finally, compare the costs of each bank and money changer to find the best option. This is such a time-consuming process. Also, forex has become a monopoly. Banks and money changers charge anywhere between 2.5% to 3.5%. Forex stores at airports charge 16% to 18% on currency exchange, keeping forex costly! Now you can compare and buy forex online in India. 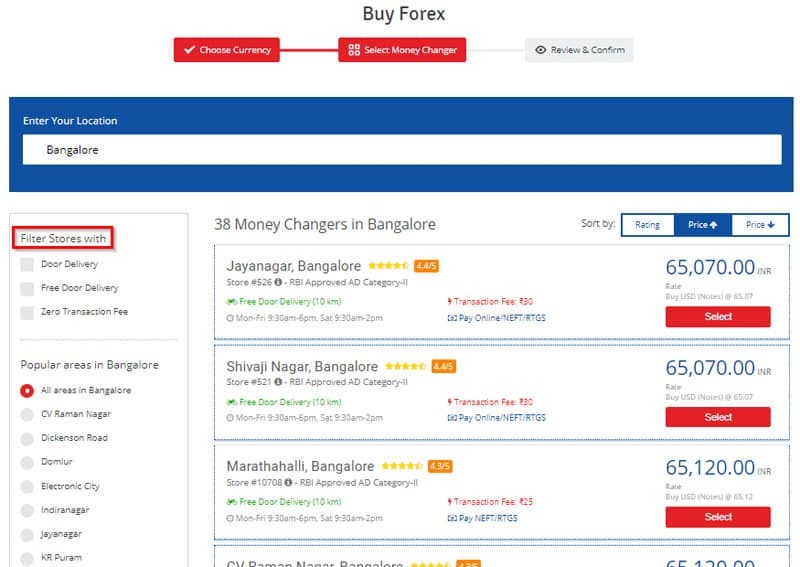 Breaking the monopoly of the brick and mortar businesses of banks and money changers comes India’s biggest online forex platform extravelmoney.com! 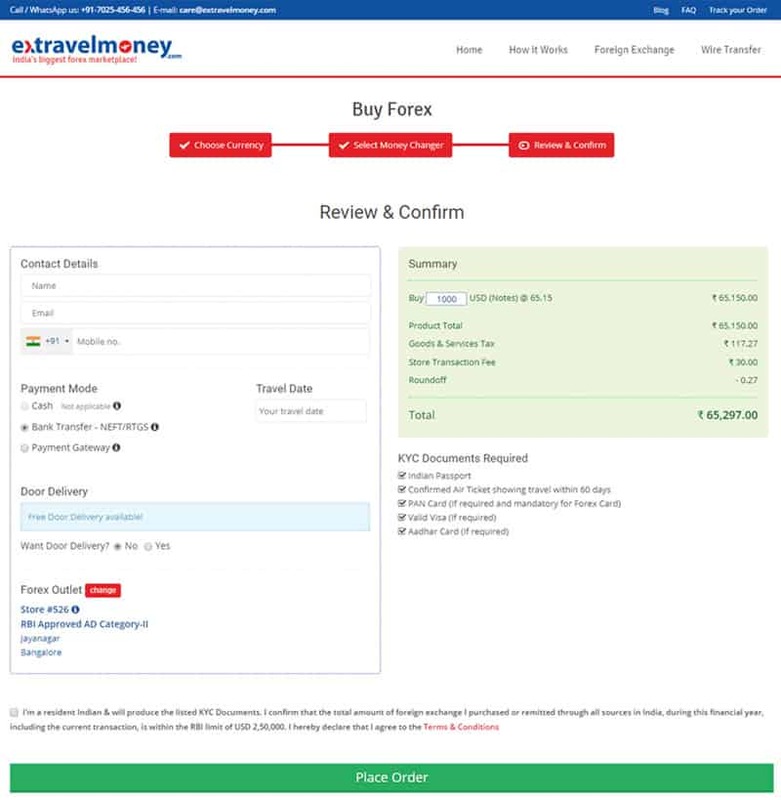 Buy forex online in India through extravelmoney.com with margins of around just 0.5% on money exchange! Also, you can freeze the exchange rate of the transaction up to 3 days, get door delivery of foreign currency and access wholesale exchange rates from more than 4500+ RBI authorized exchange houses across India. Get the best rates on forex near you by comparing across hundreds of banks and forex centres. Here are 3 simple steps to buy forex online in India. Select your forex requirements like currency exchange, money transfer abroad or buying forex card. Select the currency and enter the amount required. Get the list of money changers near you. Compare the exchange rates, service charges, and ratings given by previous customers of RBI approved exchange houses. 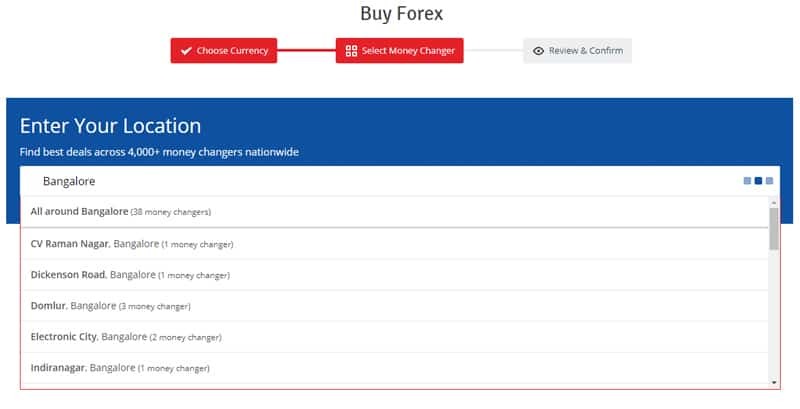 You can also filter forex stores on the basis of availability of door delivery, whether door delivery is free and zero transaction fee charging stores. Choose the best forex centre near you. Enter your email and phone number. Choose your preferred payment method i.e., via cash, bank transfer or payment gateway and place your order. 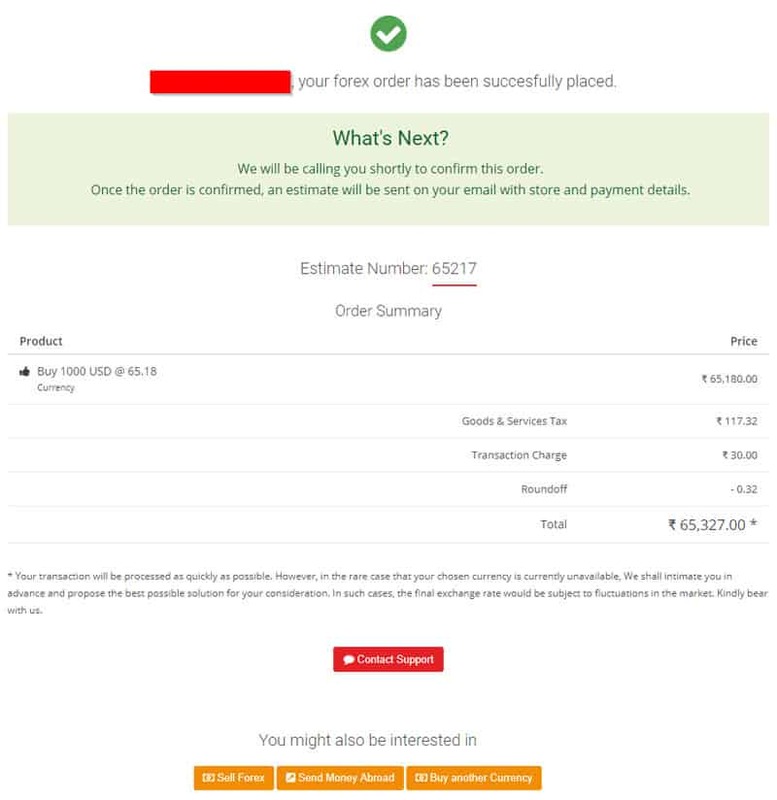 Once the order is placed, the order summary will be generated on your screen and an email and text message with the details of the order would be sent to you. After the order summary is generated, ExTravelMoney’s customer support team will contact you via phone within a matter of minutes to confirm the order. Ease of buying – ExTravelMoney is an online forex platform that lets you find good forex options without having to resort to phone calls or physically visiting banks and money changers. 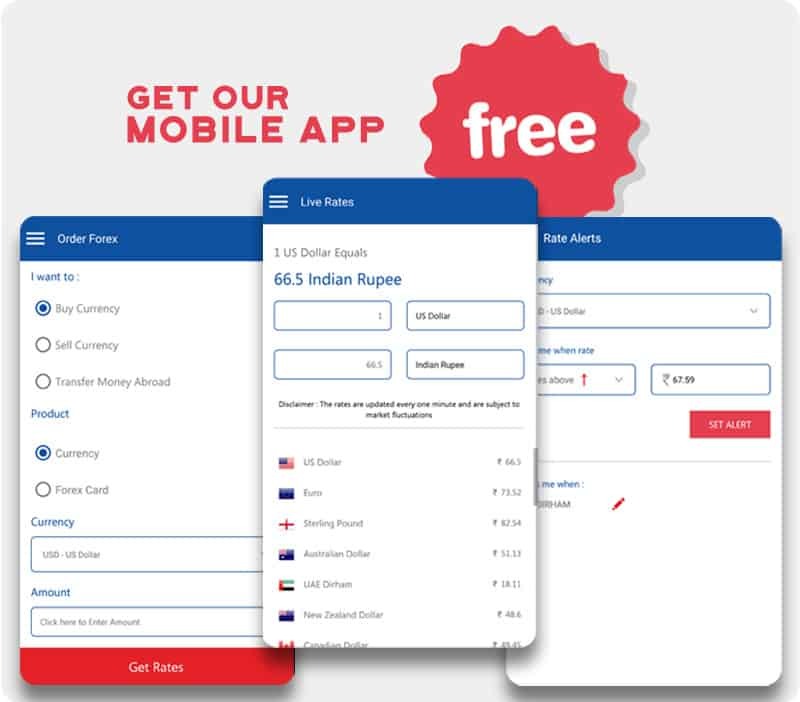 Buy forex online through the web portal or simply install the ExTravelMoney Mobile App to bring the power of buying forex to your fingertips. 22 Major foreign currencies are supported on this platform. Best exchange rates – ExTravelMoney has an agreement with banks and money changers to sell forex at wholesale exchange rates. Also, money changers in the platform compete with each other to grab customers and thus keep their rates low and competitive. Unlike traditional money changers who can’t guarantee a fixed exchange rate, ExTravelMoney gives you the best exchange rate which is fixed and won’t change, once a forex order is confirmed. Choose from 4500+ locations – ExTravelmoney has more than 4500+ RBI authorized money changers present in the platform. No matter where you are in India, chances are there is a forex store associated with ExTravelMoney near your area. Find the best store in your town/city – Money changing outlets will be shown to you based on your input location. Compare and choose the best RBI authorized forex store according to exchange rates, proximity, and ratings etc online itself! Get door delivery – You can get foreign currency or forex card delivered directly to your home or office. Knowing the best time to buy forex – Set Rate Alerts using the ExTravelMoney mobile app to get notified when a currency you are interested in buying reaches a favourable rate. Freeze exchange rates – When you place a forex transaction through the platform, the exchange rate can be frozen for a maximum of 3 days. Impeccable customer service – ExTravelMoney gives you a dedicated and impeccable customer service to process your forex requirements on a priority basis. Get forex within 24 hours of placing an order. Also, our customer care executives will guide you throughout the forex ordering process. You’ll receive timely updates via mail and SMS regarding the status of your order. 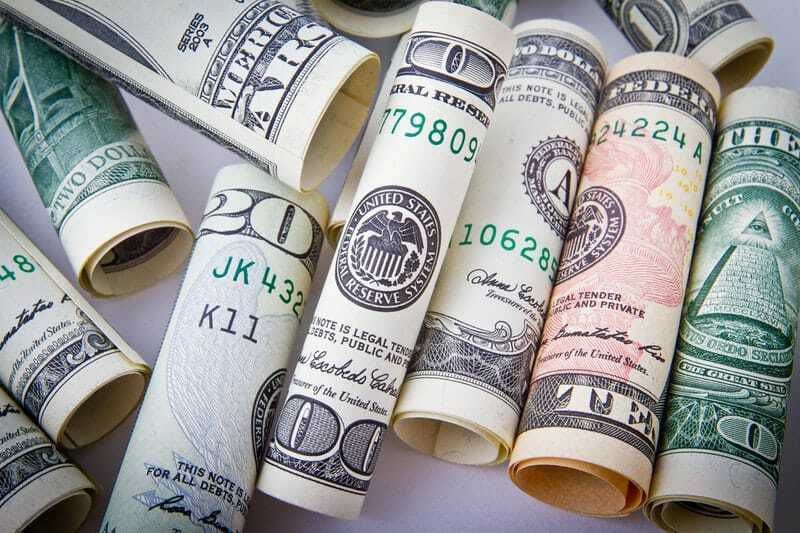 Easy modes of payment – Buy foreign currency online and pay for it easily. Available payment methods include cash, credit and debit card, net banking, NEFT/RTGS and payment gateway. No hidden charges – Buying forex directly from banks and money changers may sometimes be subjected to hidden charges. Unlike that, in ExTravelMoney, all applicable charges are shown transparently and intimated to the customer beforehand. There are no hidden charges and no extra fees are charged from the customer by us. Book your forex online from mobile! Now get the power of buying forex online in India directly on your smartphone. Download the ExTravelmoney mobile app for free (available on both iOS and Android) and find forex centres near you offering the best rates on buying forex! It is the abbreviated form of foreign exchange which just means the currencies of other countries. Forex could be in the form currency notes, coins, travel cards or traveller’s cheques. Why foreign exchange is needed? Foreign exchange is required when a traveller is going abroad. This could be someone who is going abroad for leisure travel, business travel, higher studies, or medical treatment etc. Each country has its own currency, which is the accepted legal tender there for conducting businesses or day to day transactions. Thus, all travellers who wish to go abroad must carry foreign exchange of the respective country they are going to. For example, if you are planning to go to the US, then you must carry the US Dollar. Forex card is a prepaid card which is loaded with foreign currency. Forex cards can be either single currency cards or multi-currency cards and work on either Visa or Mastercard networks. They work like regular debit cards the main difference being you have to load the funds to the card in advance. You can use forex cards for shopping abroad and paying by swiping at PoS terminals. Forex cards can also be used in ATMs abroad to withdraw money. 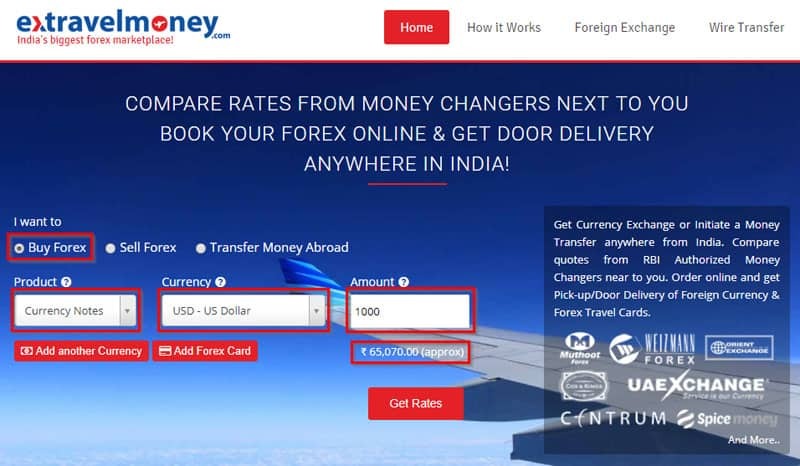 You can buy forex card online in India via ExTravelMoney. Where to buy forex in India? Money changers such as UAE Exchange, Muthoot Forex, BFC Forex etc. How to get best foreign exchange rates in India? Input your location and get the list of banks and money changers near you. Compare the exchange rates and service fees of outlets in your location via ExTravelMoney. The forex store offering the best rate will be indicated on top of the list. Choose the a money changer and buy forex online in India at the best rate. « 7 Best Places to Travel in Thailand on a Budget & Like a Boss!